wow... really looking forward to thurs... who is going? singapore0905, where will your friend be having the meet and greet? so excited. who will be going to the illuma event tomorrow? who plan to stalk her? any idea when is her departure? Ya! i am also thinking to stalking Min Jung's....hehe! but really no idea where lol. this is 3rd day lol..sigh! SORRY CAN'T REALLY HELP U MUCH. seems like there is no update of MJ in singapore. It's like totally silent about her. Only the Chinese papers have anything. AAAHH thanks to this thread for updates. Zax, you are going tmr then? I WILL see you! I am soooo going to go see her, and if I am crazy enough, I would want to stalk her! HAHA. Really really wish to see her upclose and at least get an autograph! hi, today is the big day... so who is confirmed going? wanna to meet or how? Hey, anybody knows when is her flight tmr? And HELLO Yana, I see you. Anyways, some pictures from today! 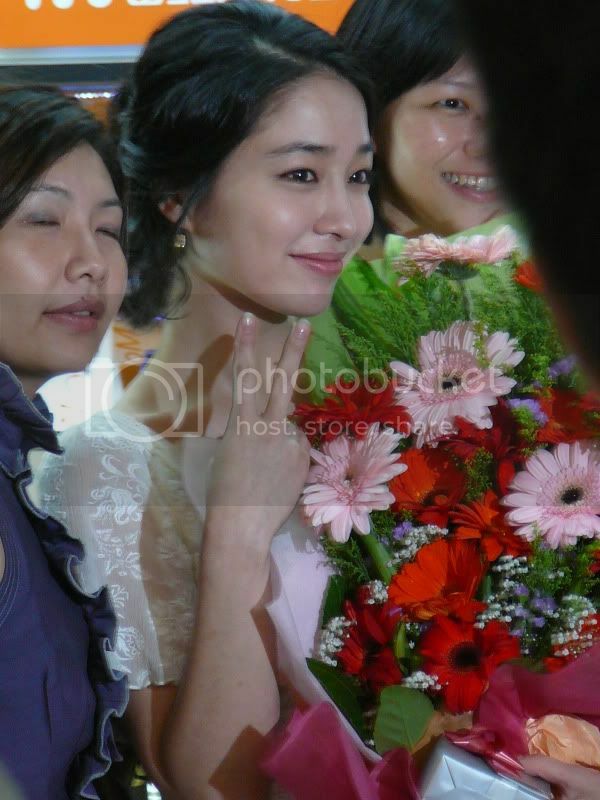 She looks really gorgeous in person - even seeing Jeon Ji Hyun a few weeks ago didn't make me as starstruck. Yea, does anyone know he flight details? I want her signature...! Or at least clearer photos of this beauty! Me a fangirl of hers now, too. I managed stand infront. but nvr got chance to snap pic wif her..
any updates on her flight details? who plans to go to the airport today? Still no news of the exact flight? There's like, a 9.15AM flight that's going to San Francisco via Incheon airport, but it's (hopefully) probably not right? Anyway, try your luck at around 10PM, since the remaining flights are around that time. Latest updates, she is still in Singapore, she checked out from her hotel about an hour ago and went for lunch. I don't know which flight she'd be departing from, but just be there 2 hours before the 10pm flight, she'll need to check in for her flight at that time. where did she go and eat? soliloguy, will you be gg to send to the airport later? So as of now, she is back at the hotel. But probably not for much longer before she leaves for the airport. T3, Checking Row 03 in New Gate. Oh man good luck to you guys!